Why do we go “all out” when we drive something luxurious? Is it the allure of class, status and tax bracket level? Is it feeling awestruck at the amount of technology and comfort inside each one of these vehicles? There is enough mixture of technology, comfort, and luxury on board each one to elevate your own driving experience. However, there is a pecking order amongst Lexuses. Without delving into the rarified air if the LFA supercar, the top of the range remains the LS – as it as since 1989. The flagship of the Lexus lineup underwent some rhinoplasty in a few places for 2013. The “spindle grille” makes its appearance on the LS, giving some personality to the big sedan. It certainly is a marked improvement upon recent LS models, but is the grille enough to invite drivers to experience the “special” feeling of Lexus’ flagship? The LS starts with its presence – even in the short wheelbase version. From the “spindle grille,” a long hood reaches to a nicely sloped windshield and a bespoke roof line. The doors are huge – still on the short wheelbase model – and open wide to accommodate everyone. The rear end is pure Lexus, with its huge taillights and sculpted deck lid. Standard eighteen-inch alloy wheels do not detract from the overall elegance of the LS. If you must have a larger presence, optional wheels are available on the regular LS 460 – in both short and long wheelbase models. You could also set the side mirrors to fold in when you lock up the LS. Step inside those huge doors, and you are treated to a cabin worthy of its flagship status. The operative word is room – and there is a lot of it. Rear seat passengers can settle into buttery semi-aniline leather with a fold-down center armrest. There are plenty of vents and controls to make yourself right at home – in the short wheelbase model, especially. Front seat occupants are literally sitting on thrones. These seats are big, comfortable, and offer plenty of power-assisted positions to get comfortable. In this model, both front seat occupants get adjustable heated and cooled seats. However, the console is quite high, but not too obtrusive to get to the shifter, the Remote Touch controller, and other functions. The interior’s materials are quite bespoke. The roof liner in this model is alcantara, another luxury not often looked at enough. You have plenty of real wood encased in protective plastic and leather everywhere you touch. 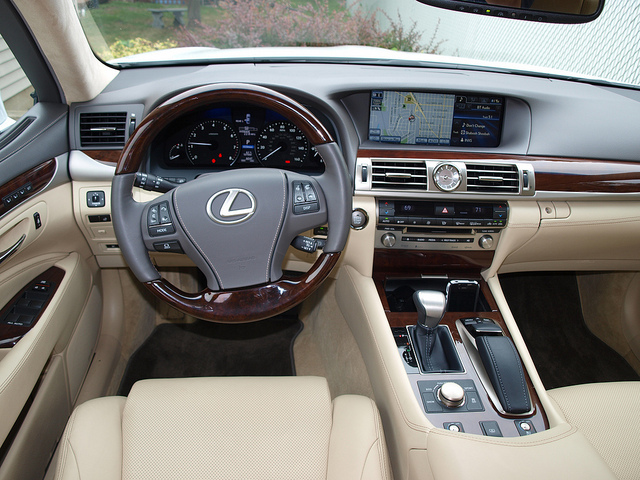 Yet, a Lexus owner would have no trouble navigating the instrument panel. Instrumentation is clear with big dials and a changeable TFT screen in-between for trip, economy, and vehicle functions. The Remote Touch controller on the console handles the wide center screen for infotainment, navigation, and Lexus Enform functions. All other controls are easy to use and right to the touch. In terms of safety, the standard LS short wheelbase model offers ten airbags strategically positioned to protect everyone on board. Motivating this flagship is the standard 4.6liter V8, with 360 horsepower and 347 pound-feet of torque. This configuration works only with the all-wheel drive system. For rear-drive models, your power numbers jump to 386 horsepower and 367 pound-feet of torque. Either way, this engine is smooth and quiet. Press the throttle harder and you can feel it move and hear it roar. Both drive lines connect to an eight-speed automatic that you cannot feel any shifts from. Just watch the tachometer to see how quickly the gears transition to the next one. This model came with all-wheel drive, providing superior grip with Dunlop SP Sport Plus tires sticking to the ground. 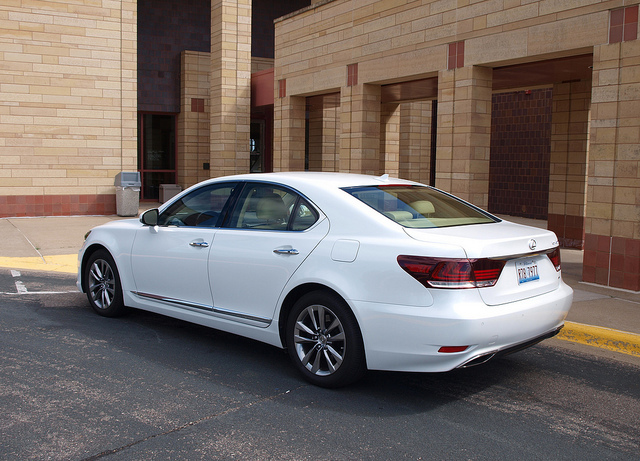 Three words describe the driving experience of the LS: Soft, smooth and quiet. The ride is supple, keeping everyone comfortable on even rougher surfaces. The suspension does react to lumpy surfaces, but does its best to keep things on an even keel. You do get a degree of roll and lean in the turns, but you will be amazed how composed the LS is for a car of its size. Steering is very sharp, though somewhat artificial in feel. Yet, you will be amazed how good of a turning radius the 200-inch long LS has to offer. Brakes are soft to the touch, but will respond well. Expect longer than usual stops in both normal and panic situations. However, the best part of the LS is the silence you feel inside on the road. The oft initial exhaust note or tire noise from rough surfaces are the only sounds you will hear in an otherwise hushed motoring experience. There is one thing to remember: While it is quiet, smooth and soft – the LS is far from numb. There is certainly a feeling of being alive inside this big Lexus. 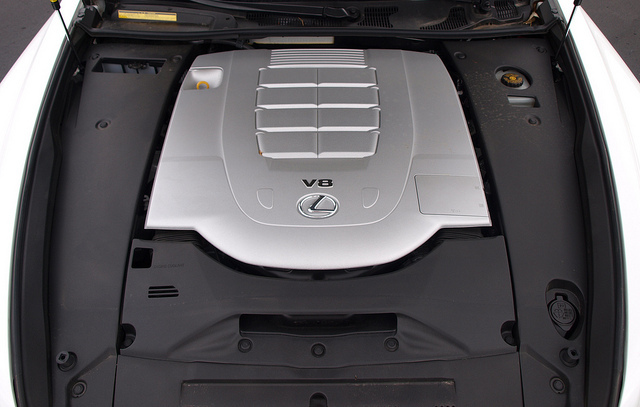 The fear of owning a 4,600-pound V8-powered flagship is its impact on fuel consumption. However, this LS will surprise you. This V8-powered all-wheel drive short wheelbase model turned an average of 22.4MPG. 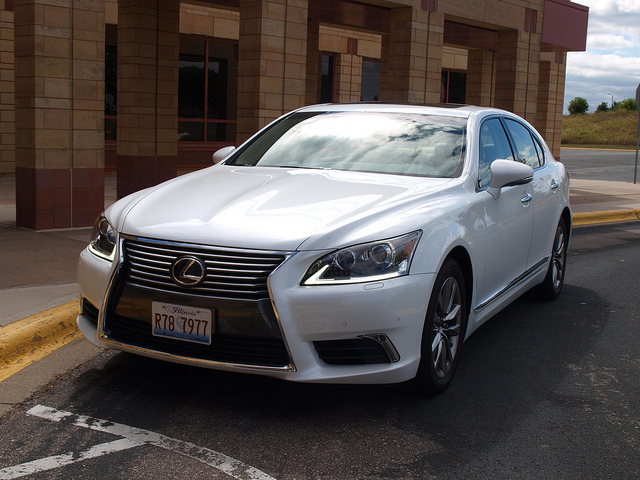 A basic LS 460 short wheelbase, rear-wheel drive model starts at $72,900. This all-wheel drive, short wheelbase example came with a sticker price of $79,249. If you must have everything, the hybrid LS 600h L long wheelbase model is available with all of the boxes ticked at $134,875. There will be plenty of people who would admit to being completely smitten by the Lexus LS. It certainly had a “special” feeling…being at ease with the world, despite even being daunted by its size at times. It is a wonderful luxury sedan. The key to these thoughts about the Lexus LS is how it was just uncomplicated to drive. Once you get past the Remote Touch, operating the LS is simple. This could be a measure of a flagship you could be on board with. We can argue on which flagship sedan would be suitable for those with the means to own one. If you happen to be one with the finances to do so, you might consider the Lexus LS as your next flagship. You could at least go “all out” when you drive one.